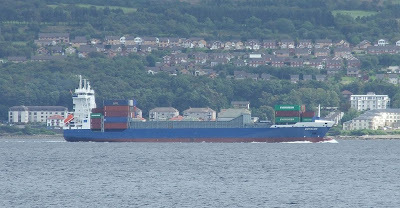 Another new ship paying her first visit to the river this month was the container ship CONELBE, which called at Greenock on Sunday. Handed over by the Sietas shipyard in Hamburg as recently as 6th August, she sailed during the afternoon with containers for Southampton. A Type 168b vessel, she is an open-hatched vessel, and has a deadweight tonnage of 11,400 tonnes. She flies the Antigua and Barbuda flag and can carry up to 868 20-foot containers. Although operating for Peter Dohle, CONELBE is owned by another German company, Bernd Bartels.